The witching hour is upon us! Halloween is tomorrow and with that we must ask, how good are your zombie fighting skills? Good news if you’re in Arlington, VA, as it’s considered one of the top ten cities to survive the zombie apocalypse – good thing GMU has a campus there (we biodefense folks are the ultimate planners!). This week was busy with the release of the Blue Ribbon Study Panel on Biodefense’s National Report. I was able to attend the panel event, so read on for my comments and your weekly dose of biodefense news! We’ve added a new page to salute our biodefense alumni and all that they do with their GMU education. GMU Biodefense students have a diverse background in their education, experiences, and interests, and we absolutely love getting to brag about all the amazing things they accomplish after their studies. 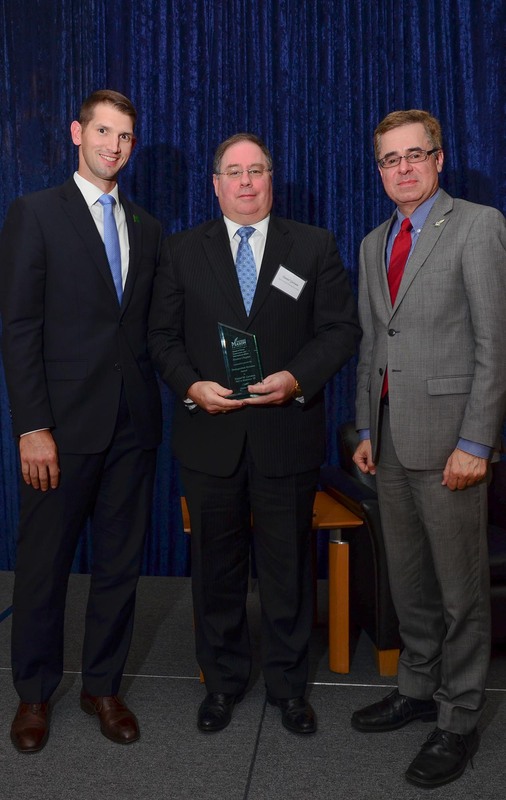 Whether it’s a new publication or an award, we hope to pass along their accolades, so please check out our new page to see how GMU Biodefense alumni are contributing to the world of global health security! Blue Ribbon Study Panel on Biodefense Releases Report– I had the pleasure of attending the Blue Ribbon panel on Wednesday, in which they reviewed their report, “A National Blueprint for Biodefense: Leadership and Major Reform Needed to Optimize Efforts”. 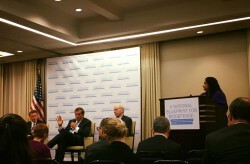 The panel event saw Senator Joe Lieberman, former Governor Tom Ridge, and former Homeland Security Advisor, Kenneth L. Wainstein, discuss the challenges of biodefense, the report, and answer several questions regarding their findings. The report is comprised of 33 recommendations that range from unification of biodefense budgeting to optimizing the National Biosurveillance Integration System and to improving surveillance and planning for animal and zoonotic outbreaks. Along with these 33 recommendations, there are 100 action items. Perhaps one of the biggest take-aways from the report is the recommendation that the Office of the Vice President of the US assume authority over biodefense efforts. There is heavy emphasis on a unified budget and centralization to combat the redundancy and current siloing we see in existing programs. Senator Lieberman discussed the role of the research and private sector’s involvement, with former Gov. Ridge noting that “we need to start thinking differently about how we incentivize the private sector.” The panel discussed that despite our past efforts, the Ebola outbreak in 2014 showed that the “threat is real, lets not wait for it to occur” and as former Gov. Ridge noted, “we don’t give bioweapon threats the attention they need. The threat is ahead of us.” Senator Lieberman commented on the Ebola situation, noting that our response was dismal and despite 10 months of warning, basic human errors led to a failure in providing hospitals with general guidelines. Whether it is an intentional bioweapons attack, outbreak of an emerging infectious disease, or unintentional, accidental release due to lab safety errors, the panel’s goal of having centralized leadership reveals the complex nature of these challenges. Also, did I mention that they included infection control in their guidelines (#18)?! Overall, I found the event highly engaging and was pleased to hear the panel members approach these topics with not only a sense of urgency, but a holistic manner to meet the challenges of biodefense. UPMC Center for Health Security has released their July 2015 report that “examines a scenario in which the US is suddenly faced with a newly emerged intentional biological threat that could produce catastrophic public health consequences and threaten our economy, government, and social structure.” The report reviews governance, public health response, medical countermeasures, healthcare system response, decontamination and remediation, and environmental detection, while making recommendations. Utilizing published literature and subject matter expert interviews, the Jump Start report scenario occurs in central Moscow subway stations and Red Square. It discusses responses in a post-Amerithrax world and highlights the need to stop the spread of infectious diseases while emphasizing that in a similar scenario, the US government should push out table-top exercises at a national level to test readiness to biothreats. The role of healthcare infrastructure and capacity comes into play, highlighting the limitations that diagnostic testing plays – even if the solutions aren’t available. I’d be curious to see a more detailed analysis of how we approach novel agents and the time-lag this can often cause in diagnosis. Also – what would be the ethical dilemmas regarding invasive medical treatments for a novel agent? Medical ethics became a very real issue during Ebola preparedness (perhaps not as well discussed in media circuits) as the invasive care capabilities of healthcare professionals in the US correlates with increasing risk for disease transmission. White House Calls for Better Biosafety – As fallout from several lab safety breaches, the White House issued recommendations that focus on labs that are registered to work with pathogens from the Select Agents list. Ranging from increased training to assessing the number of high containment labs we have in the US, this memo, with a deadline for the recommendations, sets the tone for change when it comes to biosafety. Saudi Arabi MERS Cluster – reports from Saudi Arabi’s Ministry of Health have confirmed a healthcare-associated cluster of MERS-CoV cases that involved seven individuals. The initial patient was seen in the emergency department of Almana General Hospital, with five other patients exposed in the hospital, and an additional case that is believed to not have had a healthcare exposure. All patients are under observation in the King Fahad Hospital. One of the patients is reported to be a nurse. In previous weeks, there was a cluster of cases related to janitors living together in Riyadh. The African Development Bank Group (AfDB) has approved a $33.3 million grant towards a Post Ebola Recovery Social Investment Fund (PERSIF) for efforts in Guinea, Liberia, and Sierra Leone. The US State Department is contributing a $5 million grant towards this to help support livelihood development for women, girls, and orphans from the affected countries. The goal is to build resilience in the affected countries and strengthen the economic systems while improving governance and communication. Nigeria was just removed from the WHO’s list of polio-endemic countries! After halting the spread of wild poliovirus transmission during a 15 month period, Nigeria was declared free of the disease! The WHO is continuing to work on the remaining two polio-endemic countries; Afghanistan and Pakistan. Three more cases of Ebola in Guinea were reported this week. The three patients are all family members, with one being a pregnant woman. Guinea experienced several cases last week while Liberia has been EVD-free since September 3rd and Sierra Leone just passed their six week mark without a new case. The WHO announces that TB surpassed HIV as the leading cause of death from infectious disease in 2014. Better surveillance enabled global public health teams to identify new cases. In Indonesia alone, there were one million new cases reported this year. The WHO notes that while surveillance efforts are revealing new cases, progress is still insufficient, especially in regards to drug resistance.